Church continues to assist rebuilding homes, churches, and schools affected by last year’s hurricane. Puerto Rico will forever have two stories: one before Hurricane Maria and one after. The before story seems very distant, and the after story is still developing, said Jose Alberto Rodríguez, president of the Seventh-day Adventist Church in Puerto Rico. Rodríguez never thought he would see his beloved island destroyed and in a complete shutdown by the wrath of a powerful storm. Hurricane Maria hit Puerto Rico on September 20, 2017, and the effects of the powerful Category 5 storm are still being felt. Today, four months after the storm, 35 percent of the island is still without power, many homes need repair, companies have closed down, unemployment has increased, and many are in need of assistance. In the midst of extraordinary challenges, the church continues its operations today without interruption. The church operates a hospital, university, clinic, two radio stations, 20 primary and secondary schools and hundreds of local churches. “God has been good to us…God is so good to us,” Rodríguez said. The storm did not shut down the caring spirit of church members and friends in the community. Rodríguez recounts church members and friends of the church, many of them business owners, who brought in cash to help operate the church’s Adventist hospital and university when banks were closed, and cash flow was not available. Hundreds of members flocked to their local churches to clean, cook and welcome people from their communities with hot meals every day weeks after the storm. 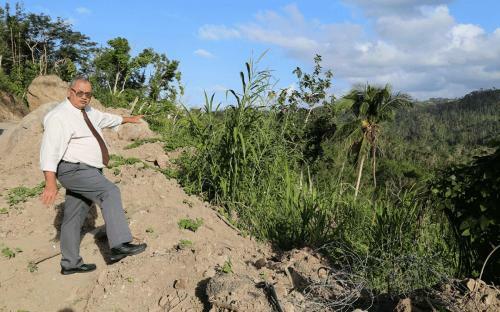 “Each church on this island has an ADRA coordinator, so when power went out, and churches were unable to communicate with leaders, they immediately jumped into action just like they had been trained to do in their surrounding communities,” Rodríguez said. If it wasn’t for that structure, things could have taken much longer, he explained. There are countless stories of how church members continue to serve in their communities even today. Their commitment to helping those around them still moves Rodríguez. “We have church members with a heart of gold everywhere you go,” he said. Also, the Adventist Church has increased its visibility as a caring church, one that moves fast to help those who are still struggling to rebuild their lives. 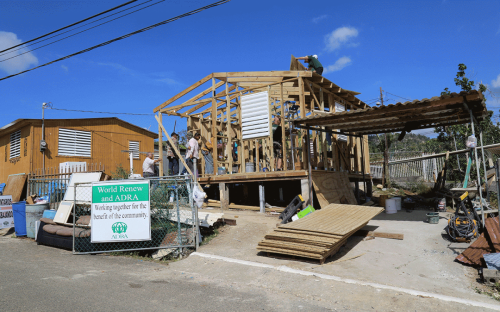 Thanks to the Adventist Development and Relief Agency (ADRA) International, ADRA Inter-America, and ADRA Puerto Rico, the Adventist Church is overseeing the construction of 125 new roofs on homes that did not qualify for FEMA (Federal Emergency Management Agency) assistance, explained Rodríguez. Around 100 Adventist churches are still without power, reported Rodríguez. That represents a third of the 320 churches and congregations across the island. “Some are operating with generators while others are without and have moved their worship services to earlier in the day when the sun isn’t so hot,” he explained. Some 345,000 people have left Puerto Rico since ‘Maria’ including some 2,000 church members. This has caused the top church leadership to look closely at their financial management, said Luis Rivera, treasurer of the Seventh-day Adventist Church in Puerto Rico. Rivera reports that 35 students did not return to the church’s Antillean Adventist University in Mayaguez this semester, representing a US$200,000 loss. Similarly, 108 students ceased enrollment across the 20 primary and secondary schools on the island, which is equivalent to a US $300,000 loss. Top church leaders have seen the need to adjust their operating budget to some 15 percent less. “Our union employees are earning 10 percent less of their salary every month indefinitely,” added Rivera. All in all, Rivera sees God’s hands still keeping the church strong and running even amid such jolting challenges. Rodríguez believes the story of the church in Puerto Rico after ‘Maria’ will continue to evolve. “The lessons we have learned after the storm will help us be better prepared for the next hurricane season,” he said.